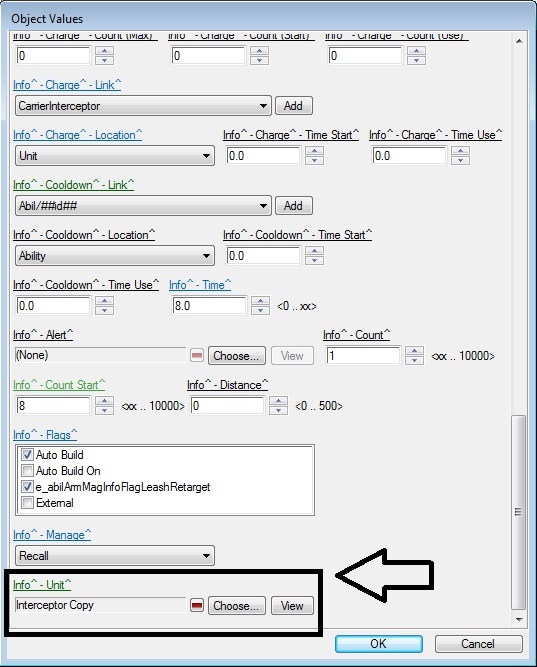 Tutorial made during Patch 3.0.1. and was done from WOL/HOTS dependency and not the LOTV. 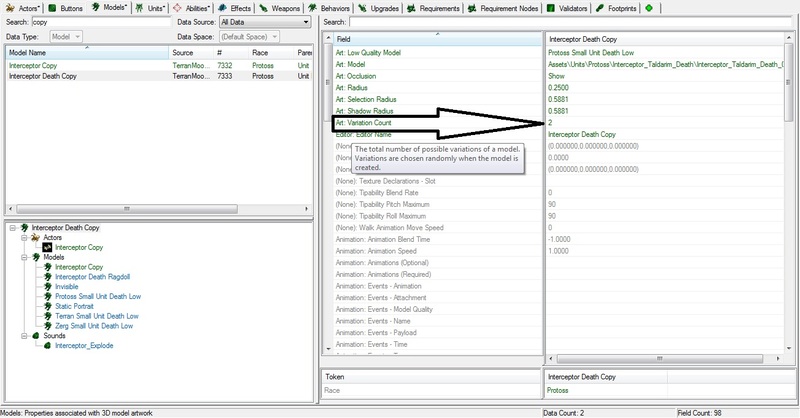 The goal of this tutorial is to duplicate specific Units and apply the alternative models on them. 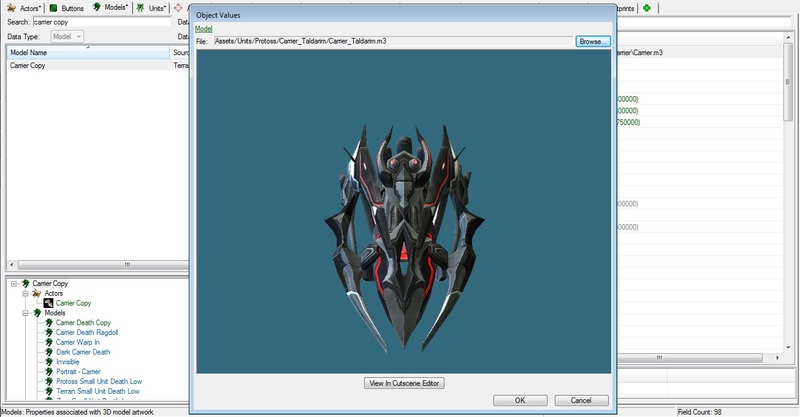 First I will start with duplicating several Protoss units to swap of to the Taldarim Protoss Models. My first project is to duplicate the Carrier and then duplicate the interceptor so I can swap the Carrier Copy to the Taldarim Carrier and interceptor model. First part is to Duplicate the Carrier and then check off what you want to Copy, I say this because there potentially could be other stuff that you might want to copy over that is not describe here, But since this is about duplicating specific Units for Alternative in-game models I will keep it simple as I can the Bare essentials to make this Model swap happen. After duplicating the Carrier Unit you should have created 1 new actor and 2 new models and 1 new unit. Details are in the picture below. Go to the Carrier Copy model you copied over this is where you will swap the Carrier Unit Model over to the Taldarim Carrier. In the picture below look at the row where the arrow is. This is the Art: Model row and this is where to replace the Carrier Model to the Taldarim Carrier model for the duplicated Carrier unit. 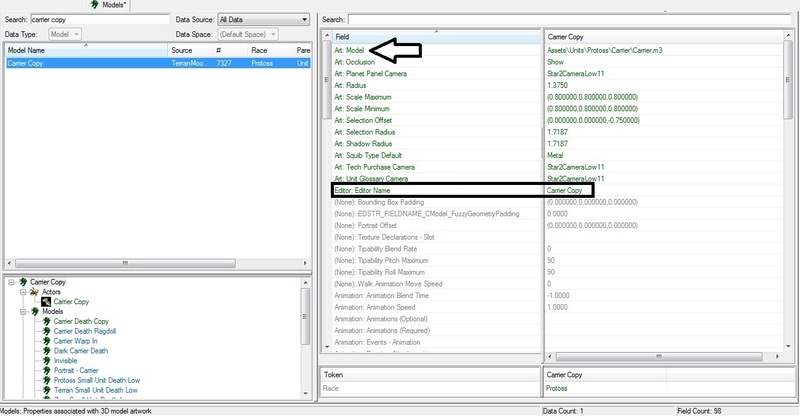 Go in the Model files in the Object and search for the "Carrier_Taldarim" for the alternative Taldarim Carrier model. Here is a picture of what the end result is of replacing the Carrier model with the Taldarim Carrier alternative. Now all that is left to do is click Ok and the Carrier Copy now appears whats is in the picture below. Now the second part is to swap the Carrier Death Model for the Taldarim Carrier Death Model and that is done the same way as the previous Model swap happened. 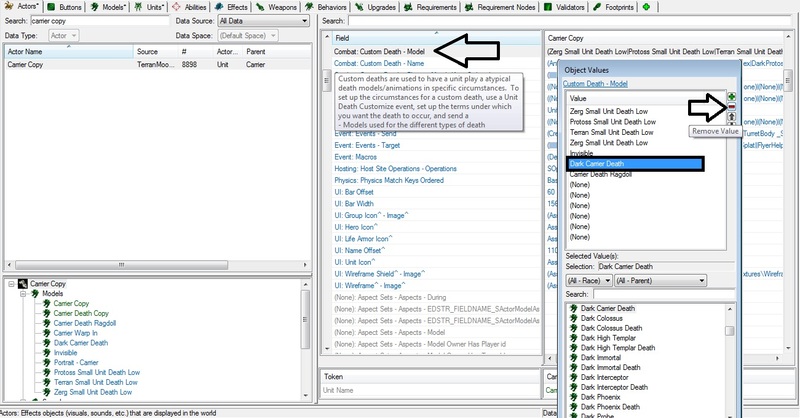 Just go to Carrier Death Copy Model and go to the Art: Model row and select the Carrier Death Model and replace it with the Taldarim Carrier Death Model in the same fashion as before. Once this is completed now the Carrier Model set has been converted over to the Taldarim Carrier model set. Now there are some more work that is needed to be done so the Taldarim Carrier Death Model is always in action. 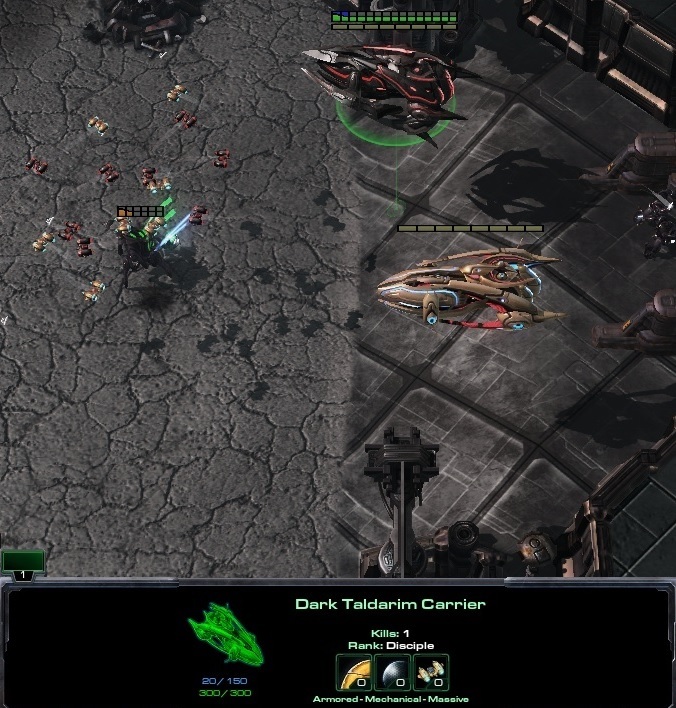 I have notice that when the Dark Protoss Upgrade is in effect that the Taldarim Carrier Death Model gets switched over to the Dark Carrier Death Model and to correct this we need to go to the Carrier Copy in the Actor tab and remove the Dark Carrier Death from the Actor so this model does not go into effect when the Dark Protoss Upgrade has been establish. 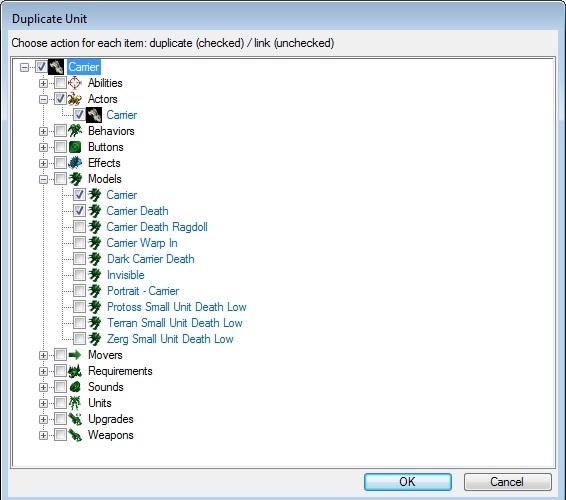 To do this go to the (Combat: Custom Death-Model) field and open up the Objects and remove the Dark Carrier Death from the list and that is it. Now all that is left to do is to change the name of the Carrier Copy to the Dark Taldarim Carrier. 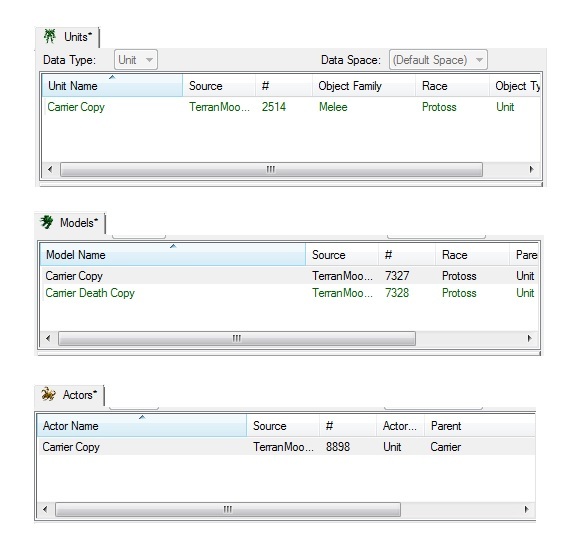 Its important to change the name of the Unit Copy in the Editor: Editor Name in the Object field so it don't mess things up and the model comes up Null. I have made a box around this field in some of the pictures so you can get the idea on where to change it. Now the next part for the Taldarim Carrier is making the interceptor and I will save that for another post. Now that the Taldarim Carrier has been created, it's time to make the Taldarim Interceptors for it. To make this interceptor variation I will duplicate the Interceptor Unit in the same fashion as the Carrier and then change the Interceptor models over to the Taldarim versions. 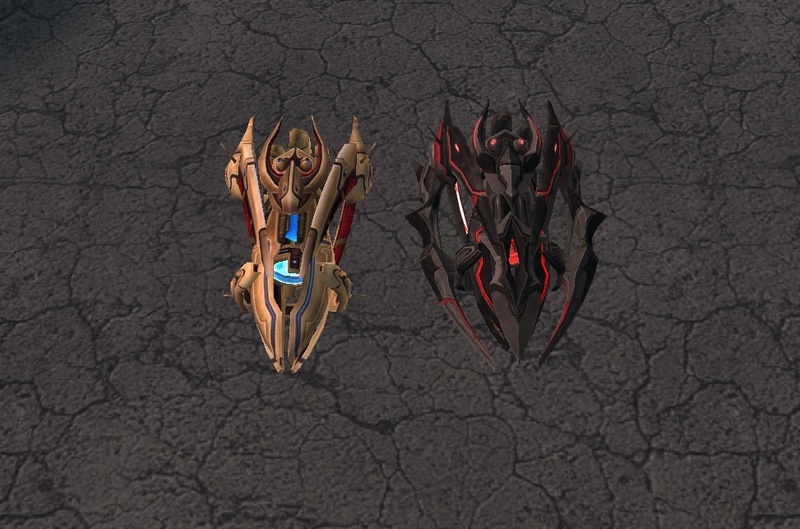 Again its important to remove the Dark Protoss Death Model in the Actor so the Duplicate Interceptor will not change it death animation when the Dark Protoss Upgrade is in effect. First step it to duplicate Interceptor. Next is to Swap the interceptor Model and Death Model to the Taldarim version exactly how I did with the Carrier. 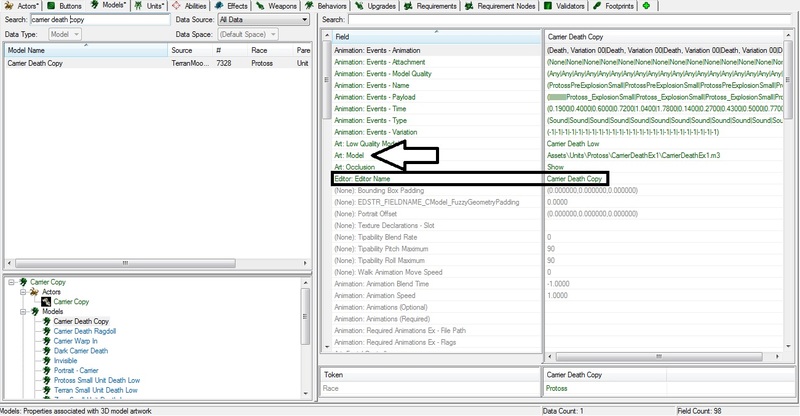 Now I've encounter an Error with the Taldarim Interceptor death animation preventing it from creating the actor and in order to correct this you will need to adjust the variation count from 2 to 1. This is a quick fix. Now the next step in order to get the Taldarim Carrier to release the Taldarim Interceptor the Carrier Hanger Ability will need to be duplicated so the Interceptor can be swap out with the Taldarim version. Only the Carrier Hanger ability will be needed to be duplicated here leave everything else unchecked. Once the Carrier Hanger Ability is duplicated. Go an open up the Build/Ammo Command and go to the bottom where the box is in the picture and change the original interceptor unit to the interceptor copy. 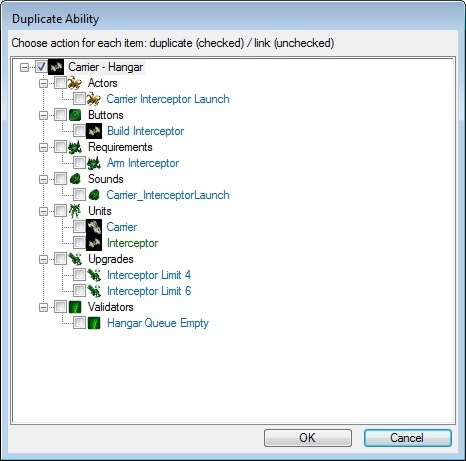 This will make the Duplicate Carrier Hangar ability to use the Taldarim Interceptor variation instead of the original one. 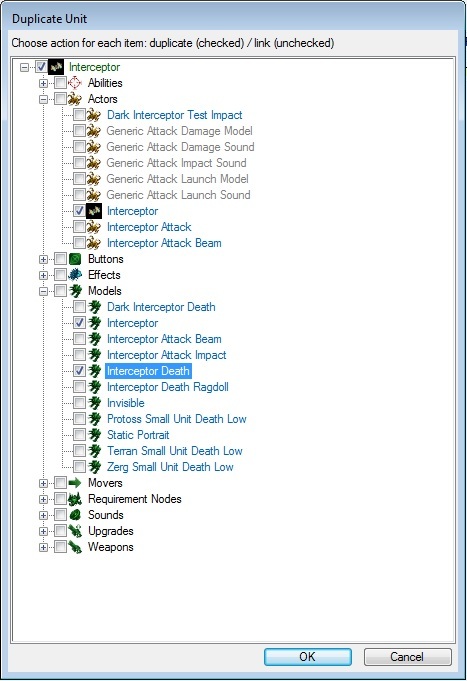 Now the Carrier ability is done, All that is left to do is add the newly made Carrier Hangar ability to the Taldarim Carrier and insert it into the command card structure so the Taldarim interceptors can now be built and deployed from it and that will complete the Unit duplication for making the Taldarim Carrier along with interceptors. Now if you look closely at the picture of the Taldarim Interceptor you can see that the attack still has the Blue Beams in it and that is because its apart of the original one also. However, once you have the Dark Protoss Upgrade in effect the Taldarim Interceptor Attack also changes to Green beams as well as the original interceptor attacks.